1. DO NOT SIGN UP IF YOU ARE NOT CERTAIN TO ATTEND AS SPACES ARE VERY LIMITED. 2. DO NOT TURN UP WITHOUT HAVING YOUR NAME ON THE GUEST LIST AS YOU WILL NOT BE ALLOWED ENTRY. 3. SEATING IS STRICTLY ON FIRST COME FIRST SERVED BASIS. 4. RCI RESERVES THE RIGHT TO REFUSE ANY ENTRY IF ALL THE SPACES ARE TAKEN AT ANY GIVEN TIME. 5. BEST TO ARRIVE BY 6.30PM TO TAKE YOUR SEAT. EVENT STARTS 7.00PM. 6. DO NOT BRING ANY GUEST ALONG. 7. NO SHOWS MAY BE BANNED TO ATTEND ANY FUTURE FREE EVENTS. 8. PLEASE BEAR IN MIND THAT THIS IS NOT AN INTERNATIONS EVENT AND YOU HAVE TO MENTION YOUR FULL NAME TO BE CHECKED IN FAISAL'S GUEST LIST UPON ARRIVAL. In continuation of attending exclusive events at different Embassies and Cultural Institutes, Romanian Embassy and Cultural Institute has invited me and kindly allowed me to invite my InterNations friends to this wonderful concert and film screening. 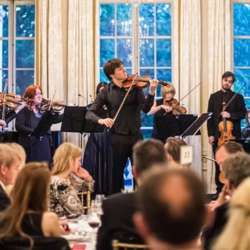 The Romanian Cultural Institute is delighted to partner with the Academy of St Martin in the Fields, one of the most prestigious chamber orchestras worldwide, for a special event that opens their Protected content Concerts Series. The evening features violinist Martin Burgess, violist Fiona Bonds and cellist Will Schofield, who will be presenting an attractive selection of famous and lesser-known works by Enescu, Beethoven, Schubert and Dohnányi. The live performance will be preceded by an exclusive screening of excerpts from the Academy’s Protected content at the George Enescu International Festival in Bucharest, including Bruch’s Violin Concerto performed by Joshua Bell. The Academy of St Martin in the Fields is one of the world’s finest chamber orchestras, renowned for fresh, brilliant interpretations of the world’s greatest orchestral music. Formed by Sir Neville Marriner in Protected content a group of leading London musicians, the Academy gave its first performance in its namesake church in November Protected content . Today the Academy is led by Music Director and virtuoso violinist Joshua Bell, retaining the collegiate spirit and flexibility of the original small, conductor-less ensemble which has become an Academy hallmark. Under Bell’s direction, and with the support of Leader/Director Tomo Keller and Principal Guest Conductor Murray Perahia, the Academy continues to push the boundaries of play-directed performance to new heights, presenting symphonic repertoire and chamber music on a grand scale at prestigious venues around the globe. Martin began playing with the Academy in Protected content , taking up the position of Principal Second Violin in Protected content . Having studied with Emanuel Hurwitz and the Amadeus Quartet he brought with him the love of chamber music. He leads the Grammy nominated Emperor Quartet (winners of the prestigious Evian International String Quartet Competition). Most recently, Martin recorded and toured the world with Peter Gabriel. Will Schofield read music at Edinburgh University and went on to study with late Romanian cellist Radu Aldulescu in Rome and at the Menuhin Academy in Gstaad, Switzerland. Will has been cellist with the Grammy nominated Emperor String Quartet since the group was formed in Protected content . He has played on numerous film soundtracks, and has collaborated with Radiohead’s Jonny Greenwood on several projects, most notably the soundtrack to the Protected content There Will Be Blood. Exclusive Romanian wine will be served. I look forward seeing you there !